Want to make hair more managable and reduce frizz for the school year? 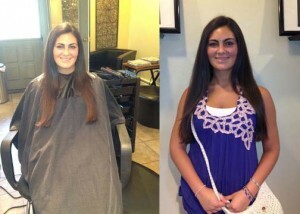 We have appointments available for you to get our Pure NV Keratin treatment, which will last up to 12 weeks. This treatment helps you maintain the hairstyle you want whether it be straight or curly. Using sulfate free products like Pureology Super Smooth shampoo & conditioner will help extend the longevity of your treatment and hair color! Call 610.670.8557 or email info@trishasalon.com to book an appointment.